Did you know that Thanksgiving is a uniquely American holiday? Other countries, like Canada, may have another holiday they have given the same name, but the concept originates with the heritage of America before there was ever a nation called the United States and continued on as a profound tradition through its formative years. We’ve been giving thanks to God in private and public from the foundation of the nation. In fact, national and state governments in America regularly issued official days of Prayer and Thanksgiving from the planting of the first colonies up until the present. Over 1400 Days of Prayer, Thanksgiving, and Fasting were proclaimed by colonial, state, and national governments from 1620-1815, and hundreds more have been issued since then. As the Pilgrims gathered their harvest in the autumn of 1621 and looked back over the preceding year, they had so much for which to be thankful that they decided to set aside a day of Thanksgiving unto God, Whom they acknowledged as the Giver of all blessings and the only reason for their survival. It was indeed a miracle that they did survive their first year in the wilderness of New England and had a good harvest. Desire for a home where they could freely worship God, and the desire to “propagate… the Gospel of the kingdom of Christ” and be stepping stones for others to do the same, motivated a band of Christians later called Pilgrims) to set out on a hazardous voyage to plant a colony in the new world of America. After 66 terrifying days at sea, where the storms were so great that they were blown unknowingly hundreds of miles north of their intended destination, they reached Cape Cod. The captain attempted to sail south to Virginia, but the weather forced them (providentially) to settle in New England. They later learned that the site they chose for a settlement – Plymouth – had been the home of the Patuxet Indians. Had they arrived a few years earlier, there would have been no place for them to settle, but a plague had mysteriously wiped out the Patuxet tribe in 1617, and no other tribe would settle in the area for fear of the same thing occurring to them. Winter had already set in as they started to build houses to protect themselves from the unrelenting cold. Scurvy and other diseases began to infect the settlers due to the long voyage, lack of provisions, and unaccommodating conditions. People began to die so rapidly that in two or three months’ time only half of the original 102 persons remained. While this was quite a tragedy, they still fared much better than the early settlers at Jamestown, who saw nine out of ten persons die in the first years of colonization. Though half of their number survived, the prospects of the coming year looked very bleak – they were surrounded by Indians, some hostile, they were short of food and supplies, and they knew little of how to survive in the American wilderness. But to their astonishment, and gratitude to God, an English-speaking Indian named Squanto came among them, took them under his care, and taught them how to survive in the new land. He showed them how to plant corn, assuring its growth by setting it with fish; he taught them how to catch fish and the times when they could find the creeks stocked with fish (for the Pilgrims had only caught one cod in the preceding four months); he taught them to stalk deer, plant pumpkins, find berries, and catch beaver, whose pelts proved to be their economic deliverance. Squanto was also helpful in securing a peace treaty between the Pilgrims and surrounding Indian tribes, which lasted over fifty years. In the words of William Bradford, “Squanto… was a special instrument sent of God for their good beyond their expectation.”4 His life story is amazing in itself. In 1605, Squanto, a member of the Patuxet Indian tribe, was captured by an English explorer and taken to England. He remained there nine years, during which time he learned to speak English. In 1614, Captain John Smith took him back to New England, but shortly after this he was again taken captive and sold into slavery at a port in Spain. Providentially, some local friars bought and rescued him. Thanks to God, his instrument Squanto, and the character and determination of the Pilgrims, half of them had survived an unimaginably difficult first year. Moreover, they harvested a sufficient food supply for their second winter at Plymouth. Even though there was no surplus food, things looked much better than the preceding winter. Governor Bradford appointed a day of Thanksgiving and invited the nearby Wampanoag Indians (Squanto’s adopted tribe) to celebrate and give thanks unto God with them. Chief Massasoit and ninety of his men came and feasted with the Pilgrims. They ate deer, turkey, fish, lobster, eels, vegetables, corn bread, herbs, berries, pies, and the Indians even taught the Pilgrims how to make popcorn. The Pilgrims and Indians also competed in running, wrestling, and shooting games. Massasoit enjoyed himself so much that he and his men stayed for three days.6 It is easy to see where the American tradition of feasting at Thanksgiving began. While many people today follow the Pilgrim’s example of feasting at Thanksgiving, they too often ignore the entire reason that the Pilgrims set aside a special day – that was to give thanks to Almighty God and acknowledge their utter dependence upon Him for their existence. While many today take ease in having plenty, never seeing a need to cry out to God, the Pilgrims relied upon God in their lack and thanked Him in their abundance. Their trust was in God and not in their abundant provisions. This was seen even more fully in the two years following their first Thanksgiving. Shortly after their Thanksgiving celebration, thirty-five new persons unexpectedly arrived who planned to remain and live at Plymouth. These being family and friends brought much rejoicing, but when they found out they had no provisions it also brought a soberness. Yet their reliance was upon God, so they gladly shared their food, clothing, and homes. With the new additions, their food, even at half allowance for each person, would last six months at most. Their provisions had almost completely run out when they spied a boat in May of 1622. They hoped the English Company who had sponsored their colonizing Plymouth had sent provisions; however, this boat not only did not bring any food (nor the hope of any), but seven more hungry people to stay in Plymouth. In their extreme hunger, as in times of plenty, they put their complete trust in God to provide. That spring and summer of 1622 God miraculously fed them, even as the ravens fed Elijah in the wilderness. He provided because the Pilgrims had determined to walk in the way of their Lord Jesus. This was most evident in early summer when sixty “lusty” men (as Bradford called them) came to them for help. Even though these men showed no gratitude, the Pilgrims still gladly took care of them, for many were sick. They gave them housing and shared their meager provisions. This they did for almost the entire summer until the men left. Like the year before, the harvest of 1622 proved insufficient to meet the Pilgrims’ needs. Outside help appeared doubtful, so the Pilgrims considered how they could produce a larger harvest. Through God’s wisdom they chose to replace the collective farming they had practiced the two preceding years (being imposed upon them by their sponsoring company) with individual farming, assigning to every family a parcel of land. Bradford wrote: “This had very good success, for it made all hands very industrious, so as much more corn was planted than otherwise would have been by any means the Governor or any other could use… and gave far better content. The women now went willingly into the field, and took their little ones with them to set corn, which before would allege weakness and inability; whom to have compelled would have been thought great tyranny and.”8 As they were freed from economic communism and entered into individual enterprise, abundance began to come upon these people. The Pilgrims’ hard work, resulting from them being able to directly benefit from the fruit of their labors, caused them to plant about six times more crops than the previous year. While labor certainly increases our prosperity, there are other factors. God wanted the Pilgrims to never forget that it is the Lord that gives men the power to get substance or wealth (Deut. 8:18). The harvest of 1623 brought plenty to each person, with the more industrious having excess to sell to others. From the time they started a biblical economic system, no famine or general want ever again existed among them. That autumn of 1623, the Pilgrims again set apart a day of Thanksgiving unto God. They had much to give thanks for and knew Who to acknowledge. And be sure to watch and share this enlightening illustrated video with your family. A Compilation of the Messages and Papers of the Presidents, Vol. 8 (New York: Bureau of National Literature, Inc., 1897), p. 3374. 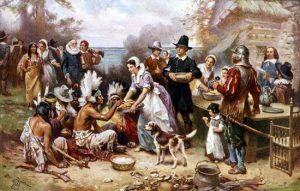 Some colonists in Virginia actually observed the first Thanksgiving celebration in America. This occurred at the Berkeley plantation in 1619. It is the Pilgrims, however, who provide us with the tradition of a Thanksgiving celebration. Lincoln’s proclamation for a day of thanksgiving was certainly not a new event in our history, for various colonies, congresses, and presidents have made many such proclamations throughout our history. William Bradford, Of Plimoth Plantation (Boston: Wright & Porter Printing, 1901), p. 111. Spelling has been changed to modern usage in this and the other quotes from Bradford. Peter Marshall and David Manuel, The Light and the Glory (Old Tappon, NJ: Fleming H. Revell Co., 1977), pp. 130-132. See also, Bradford, pp. 116-117; and Mourt’s Relation: A Journal of the Pilgrims of Plymouth (Plymouth, MA: Plymouth Rock Foundation, 1985), p. 48. Mourt’s Relation, pp. 72-73; Marshall and Manuel, pp. 135-136; see also, The Pilgrims and Plymouth Colony, by the editors of American Heritage (New York: American Heritage Publishing Co., 1961), pp. 102-103. Nathaniel Morton, New England Memorial, pp. 64-65. Messages and Papers of the Presidents, Vol. 8, pp. 3429-3430.